Rosie Discovers - Come Discover with Us! You have heard the phrase you have to walk a mile in someone’s shoes before you can understand them. Well, this is a twist with me filling the ‘shoes’ of an expectant mother. Most people fear the belly, but I had to try on Ford’s empathy belly. 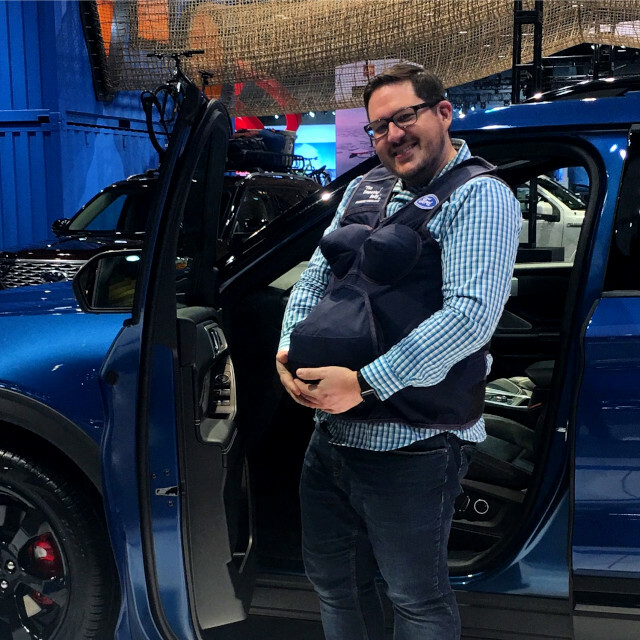 The Detroit automaker’s pregnancy-simulating apparatus aims to help the non-expectant better understand what to expect when someone else is expecting. Ford’s engineers apply that empathy to making moms-to-be safer and more comfortable behind the wheel. 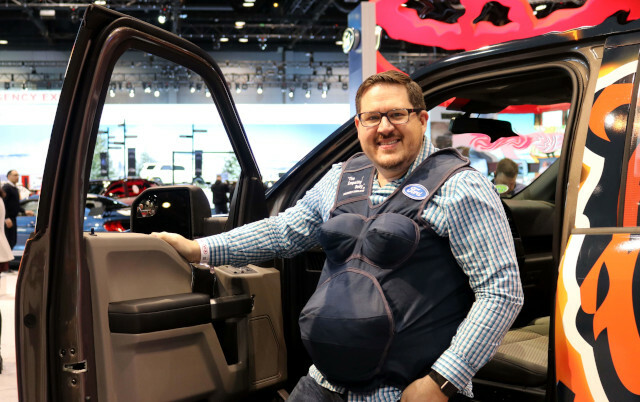 Ford uses the empathy belly to ensure pregnant drivers are considered during the car design process. Engineers slip on the suits to learn how range of motion and other things affect expecting mothers. 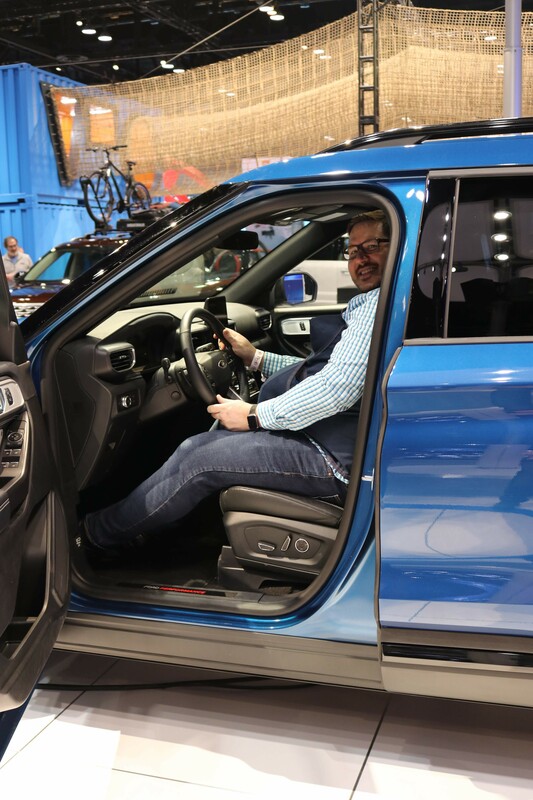 This includes getting in and out, adjusting mirrors, accessing the cargo area and even changing lanes. This awareness helps them rethink how they approach ergonomics to encompass those needs. The suit consists of several pieces, the largest of which is a vest that fits around the torso with Velcro straps, and comes complete with belly and breasts. It fits over a compression strap that goes around the chest to create the shortness of breath felt by expectant mothers. Once that’s in place, two balls roughly the size of an orange and the weight of a shot put are placed into tight pockets on either side of the stomach to mimic the poking sensation of the fetus’ limbs. Finally, another weight Velcros to your lower back for further pregnancy-approximating discomfort. Ford says the whole package weighs 30 pounds — the average total weight gain for a pregnant woman. 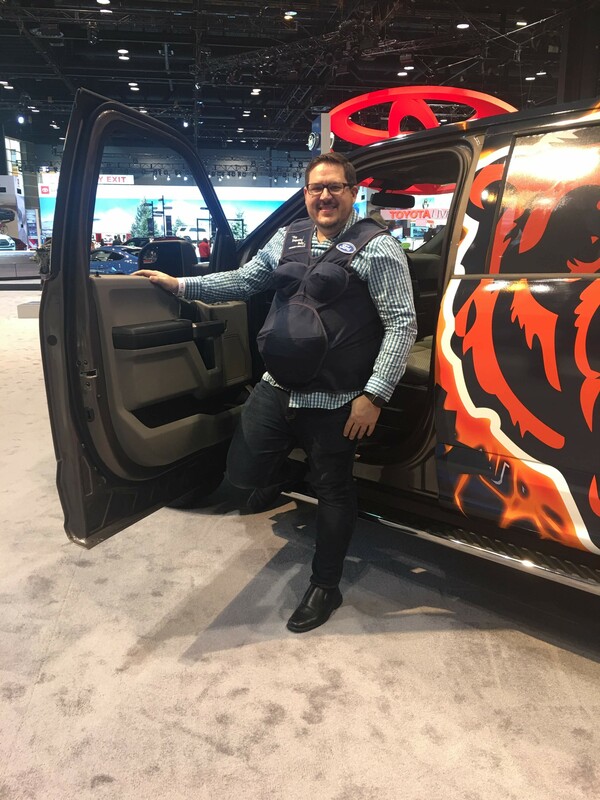 After learning about Ford’s empathy belly, I was eager to find out what it was like sitting in the driver’s seat during the third trimester for an expecting mother. I wanted to experience the range of vehicles Ford has to offer in their line up. Just because you are pregnant does not mean you are changing cars! 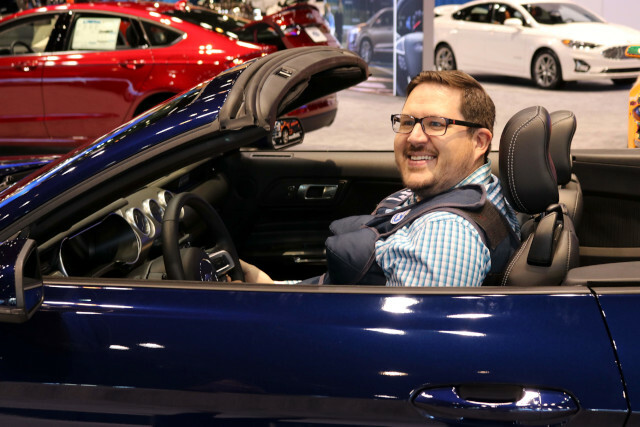 The Ford lineup at the Chicago Auto Show had the 3 most different sized vehicles: the Ford Explorer, the Ford F150 and the Ford Mustang. I was ready to experience the challenges behind the wheel with a sizeable baby bump. The first vehicle was the Ford Explorer. To my surprise it is easy to get in and out of the Explorer. I was extremely comfortable in the driver seat. A pleasant surprise was that I can move the steering wheel closer to the dash instead of moving my seat back to make room for my growing belly. 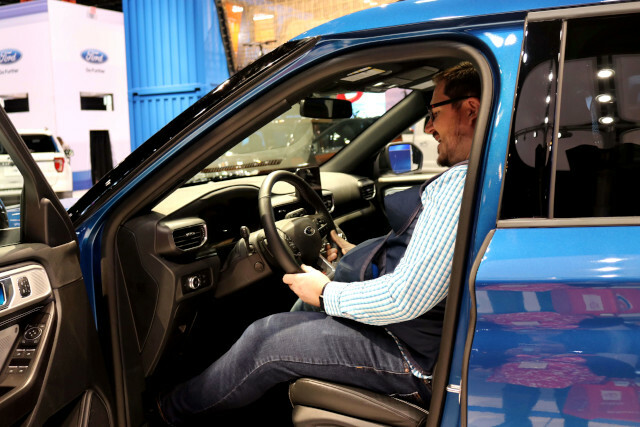 With the Explorer being an SUV, with a more accommodating ride height, I was imagining the climb up into a truck or the drop into a Mustang. So I glided over to the Ford F150 and the Ford Mustang. Next, I tried the Ford F150. I had to go there first it is the Chicago Bears F150! Getting into the F150 was the hardest out of the three models. Having to climb up into the truck while holding on and supporting my baby bump made it difficult. Once in the F150, it had plenty of room for me and my baby. Finally, I was ready to try the smallest and shortest. So we glided over with the empathy belly to the Ford Mustang Convertible. I was right it had similar challenges to the F150 except instead of climbing up I was climbing down. It wasn’t as bad as I thought it might be because the top was down. I could support myself on the side to help lower me and my belly. But the real problem came when I tried to get out of the car. I was tempted to ask someone for a hand. But since we were in a convertible I could push up from the side of the car to get out. Blind Spot Monitoring with Cross Traffic Alert: Uses rear corner-mounted, side-looking radar that detects other vehicles around the car. This illuminates an indicator lamp in the rearview mirror. When backing out of a parking space, the same sensors can detect vehicles approaching from the sides that may not be visible to the driver. Adaptive Cruise Control: Helps drivers maintain a pre-set distance from the vehicle in front of them. Using a radar module mounted at the front of the vehicle, this measures the gap and closing speed to the vehicle ahead. The system automatically adjusts the speed of the car to help maintain a pre-set distance from the vehicle in front. Pre-Collision Assist with Emergency Breaking: The car will scan the road ahead of you. If any hazards appear, then you will get an alert. If you do not take corrective action, then the brakes will automatically apply. All of this and more can be found inside a Ford. You can find more information about the Co-Pilot 360 and ergonomic design on their website. 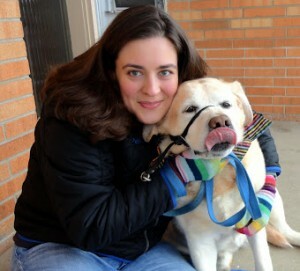 Of course, you may be more interested to test out the comfort for yourself!